Select Size 3" x 6" x 9" 4" x 6" x 9"
Our Cork Yoga Blocks allow you to improve your yoga practice while causing less environmental impact. These yoga blocks are made from cork, a sustainable natural resource. Cork blocks provide strength and stability. The natural look and feel can help provide the sense of peace and tranquility required for your yoga practice while helping protect our environment. 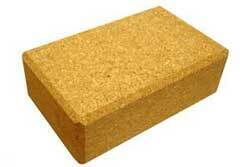 Strong, stable and durable our Cork Yoga Blocks have contoured edges for added comfort. They are easy-to-grip and have a textured surface. Can assist the beginner and aid the experienced by providing support for postures that are otherwise too difficult or unattainable. Our Cork Blocks are environmentally friendly, lightweight (about 2 lbs) and made of a resilient solid structure. Our cork yoga blocks allow you to improve your yoga practice while causing less environmental impact. These yoga blocks are made from cork, a sustainable natural resource. A cork block provides strength and stability. The natural look and feel can help provide the sense of peace and tranquility required for your yoga practice while helping protect our environment.